With more than 150 online programs, Florida has been at the forefront of online education since 1996, when it launched the Florida Community College Distance Learning Consortium. The Consortium allowed public and private colleges to collaborate and facilitate online learning in the state. In 1999, the Florida Virtual Campus was created to provide quality online resources for high school and college students alike. This pedigree has led to a wide range of online learning opportunities for Florida students; the key now is figuring out how to find the right one. The following guide walks students through the process of identifying and funding a degree program at one of the Florida’s best online colleges and universities. Read on to learn more. Choosing the right online college in Florida depends on the unique needs of each student. For some, affordability trumps everything, with low-cost tuition the driving factor in their decision. For others, it’s accreditation, which can mean the quality they need to graduate and transition into a top career with a trusted employer. But which schools have the right combinations of cost, quality, resources and convenience to attract and help the most students across the state? 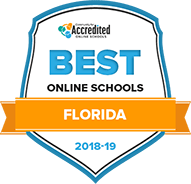 Let’s see which accredited online colleges in Florida made the list of the top in 2018. The University of Central Florida not only offers an array of programs, but it has a strong focus on academic support though its Online Connect Center, where coaches are available to students throughout their programs to help strategize for success and identify resources, from anywhere in the world. An undergraduate student could complete an entire 4-year bachelor's degree online in one of 20 majors, including English, history, international and global studies and even nursing. UCF offers more than two dozen master's degrees, in subjects such as educational leadership, forensic science, hospitality and tourism management and emergency and crisis management; as well as doctoral degrees in nursing and many graduate certificates. The master's 30+ credit-hour requirement can be completed within 2 to 4 years, usually. Among UCF's standout offerings is its wide array of specialized online health care degree programs, which include certificates, bachelor's degrees, master's degrees and doctoral degrees, and cover such subjects as nonprofit management, autism spectrum disorders, research administration, nursing and Executive Master of Health Administration, where students will study emerging techniques, innovative models and advanced technology that are focused on prevention helping them advance in health care. The University of Florida boasts that it provides "the same great programs and elite faculty" that it offers on its main campus but without brick-and-mortar boundaries. Online programs geared toward nontraditional students with busy lives or families can benefit from more than 100 online programs for completing 4-year degrees. Alumni testimonials of UF's online programs highlight its "online education, real world connection" component, with stated benefits including an online lecture component, which enhances a feeling of connectedness to the community, as well as the career advancement afforded by an online degree. UF strives to provide flexibility and highly customized experiences to students, through a combination of 19 undergraduate majors for upper level students with at least 60 transfer credits, in subjects such as communications, biology, geography and fire & emergency services, as well as 7 undergraduate minors. The majority of UF's online offerings include more than 80 master's degrees, which vary from urban and regional planning to student personnel in higher education, pharmaceutical sciences, environmental engineering sciences and aerospace. Each program has different requirements, but students can usually complete their degrees with 30-36 credits in 2-4 years. The majority of courses are asynchronous, so they can be completed at times that are convenient for students, and students are assigned academic advisers who work closely with them throughout their programs to provide guidance on course loads, challenges and more. Southern Florida University's "Innovative Education" program sees flexibility through online learning as essential for busy students. The online course offerings reflect the large student network of more than 50,000 students on and off campus. In addition to its hundreds of online courses, USF offers fully and partially online undergraduate degrees and fully online graduate degrees. Students approaching junior year completion of courses who want to study nursing, information studies, public health or criminology have 7 bachelor's degrees to choose from to complete their degrees. The graduate studies offerings are vast and wide-ranging. Students can choose from more than 30 degrees in the following fields of study: arts, education, public health, global sustainability, medicine, pharmacy, engineering, behavioral and community services and even an interdisciplinary degree in cybersecurity. Graduate completion requires between 36 and 39 credit hours. Some programs boast that students can complete in as few as five semesters, but the advantage of online programs is that students can progress at their own pace. Florida State University is recognized as a "Preeminent University" by the state of Florida which acknowledges its exceptional student retention and graduation and continues to invest in student-centered experiences and inspiring "academically motivated, intellectually curious, and socially conscious" students. The online program offerings through Distance@FSU are vast and reflect the "preeminent" nature of the institution. Undergraduates who have achieved 60 credits or more can transfer these credits and complete online degrees in public safety and security, computer science, criminology, and social science. Graduate students have even more online program offerings from master's degrees in law enforcement intelligence, business administration and educational leadership to a doctoral degree in educational leadership and policy. Non-degree-seeking students can also choose from more than 20 certificate programs, including event management and emergency management, as well as a homeland security graduate certificate. Degree-seeking graduate students may complete between 32 and 39 credit hours or more, depending on the program. Most courses are asynchronous, which is an advantage for busy students, but there are also synchronous and mixed courses that would require face-to-face instruction on occasion. Master's programs can take between 2 and 4 years, depending on the student's pace. Florida International University is a top-tier research institution based in Miami that emphasizes research as a major component of its mission. When it comes to online learning, FIU is committed to student completion, with several of its online degrees structured in a way that makes it possible to finish in as little as one year. Accredited by the Southern Association of Colleges and Schools Commission on Colleges, the university strives for a "high-tech, high-touch" student experience that is both interactive and challenging, with online classes paralleling the academic rigor found in on-campus courses and programs. FIU offers 40 fully online bachelor's degrees in a large range of subjects, from humanities to hospitality management to high-tech specialties such as computer engineering and the internet of things. More than 30 graduate degrees round out FIU's online degree offerings, in such wide-ranging topics as African and African diaspora studies, engineering management, global affairs with an international crime and justice track, health care, hospitality management, education and real estate. A number of online minors are also available. Finally, the university offers two online combination bachelor's and master's degrees that take a total of 5 years: a recreation and sport management BS/MS, and a hospitality management BS/MS. Formerly known as Everest University, Altierus Career College is a non-profit institution with 3 campuses open for enrollment in Tampa, Florida; Norcross, Georgia; and Houston. With a focus on short-term career training, Altierus offers several diploma programs in a variety of fields. Students can train to be a medical technician, dental assistant or electrical technician; additional tracks are offered in massage therapy, computer information technology and HVAC. Most programs are offered fully on campus; however, 2 are designed in a hybrid format: medical billing and coding, and pharmacy technician. For these hybrid programs, students are expected to attend classes 3 days per week on campus, and supplement their learning with additional coursework online. Both programs are structured to be completed in 8 months. Altierus is accredited by the Accrediting Commission of Career Schools and Colleges, a national organization. Any testing or certification requirements necessary to practice professionally are also built into the curriculum. From its first days as a public state university started in 1964, Florida Atlantic University was intended to push education to new frontiers. In fact, it describes itself as "the first Information Age university," with an early goal of using broadcast technology to transmit classes to students, no matter where they were. Today, FAU still maintains a focus on meeting students' needs by offering online programs that can be completed from anywhere, at any time. Online classes are designed to mirror those offered on campus, and many of its distance-learning courses are certified by Quality Matters, a third-party quality assurance organization. The university, as a whole, is accredited by the Southern Association of Colleges and Schools Commission on Colleges. FAU offers 7 undergraduate degree programs; these include bachelor's degrees in business administration, criminal justice and public safety administration, as well as a certificate program in geographic information systems (GIS) and an RN-to-BSN program. Additionally, its online graduate programs include an MBA, as well as master's degrees and graduate certificates in education, engineering, computer science, nursing and GIS. A large number of online minors are available as well. Saint Leo University is a nonprofit, liberal arts university founded in 1889 as a Catholic university, although it serves students of all faiths. Student experiences are heavily focused on adult learners, and online programs at both the undergraduate and graduate levels are designed with career training in mind. Coursework emphasizes real-world applications, constructive feedback and acknowledgment of adult learners' prior experience. Courses are taught by faculty with advanced degrees who are professionals in their fields, and the university is accredited by the Southern Association of Colleges and Schools Commission on Colleges. Saint Leo's online program offerings include 5 associate degrees, 20 bachelor degrees, 37 master/professional degrees and 4 doctoral degrees, as well as 6 minors that may be completed entirely online. Bachelor's degrees feature numerous career specializations, including business administration degrees with such emphases as logistics, marketing or project management; criminal justice degrees that focus on criminalistics or homeland security; and a sociology degree specializing in diversity and inequality. Similarly, Saint Leo's master's degree programs include numerous MBAs in such specialties as cybersecurity management, health care management or marketing; master of education degrees in exceptional student education or reading; and master of criminal justice programs emphasizing such areas as critical incident management or forensic science. Based in Jacksonville, the University of North Florida reaches students from all over by offering several fully online degree and certificate programs, as well as hundreds of individual courses delivered via distance learning. To facilitate students' on-time graduation, a number of these courses and programs are offered on an accelerated 8-week schedule. As part of the school's goal to ensure high levels of student learning, interaction and engagement, UNF's 11 fully online programs are intended only for upper-level graduate or professional students and include an RN-to-BSN nursing degree; master's degrees in nutrition, criminal justice, educational leadership and American Sign Language (ASL); doctoral degrees in nutrition and nursing; and graduate certificates in healthcare informatics, early childhood education and TESOL (Teachers of English to Speakers of Other Languages). The majority of programs allow students to complete their studies entirely off campus, but some do require occasional on-campus participation. UNF is accredited by the Southern Association of Colleges and Schools Commission on Colleges, and online classes are headed by the same faculty that teach in-person classes. Founded in Fort Lauderdale, Florida, in 1964, Nova Southeastern University began as an innovative graduate institution in the physical and social sciences. It has since added undergraduate and distance education programs to its offerings. Accredited by the Southern Association of Colleges and Schools Commission on Colleges, the school is noted for its innovation in research, and faculty are professionals actively engaged in their fields. NSU offers fully online undergraduate degrees in health science, human services administration, nursing (RN-to-MSN), psychology, recreational therapy, respiratory therapy and speech, language and communication disorders. There are also nearly 60 graduate and professional degree programs available entirely online, in a multitude of subjects including accounting, business administration, education, health sciences, information technology and nursing. Online students may also enjoy NSU's emphasis on experiential learning, during which students may conduct research alongside a faculty mentor or earn credit by working or volunteering in the community. University of West Florida offers online bachelor's degrees in Exceptional Student Education, Health Sciences, Maritime Studies and Nursing. Distance learners can also take advantage of its Clinical Laboratory Sciences program, which prepares students to be Medical Laboratory Scientists (MLS). Graduates perform the full spectrum of lab tests in scientific areas such as hematology, clinical chemistry and microbiology. For any of the online bachelor's programs, applicants should have at least a 2.5 GPA. UWF also serves as an advocate for veteran students and their families, offering VA education benefits such as active duty tuition assistance, academic advising, tutoring, laptop loan programs, counseling and disability accommodations. Transfer students must have a cumulative GPA of 2.0 and may be eligible to receive credit for up to 60 credit hours. First-time freshman applicants should have 18 academic units of college-preparatory, year-long courses or equivalents in English, mathematics, natural science, social science, a foreign language or American sign language. Prospective online students should submit their applications by June 1 for admission for the Fall term, November 1 for Spring and April 1 for Summer. Florida Agricultural and Mechanical University is a public, historically black university with over 9,600 students. Online learners can pursue master's degrees in Business Administration, Public Health or Nursing. FAMU's Master of Public Health degree is a top producer of African American public health professionals. Through the FAMU Institute of Public Health, online graduate students prepare for careers at agencies like the Centers for Disease Control and Prevention, Congress, U.S. Environmental Protection Agency and Florida Department of Health. FAMU public health graduates also work at pharmaceutical companies, hospitals and clinics. Competitive applicants for any of the 3 master's programs have a bachelor's degree with a 3.0 GPA or higher in the last 60 credit hours of their undergraduate work. Transfer credits from courses in which students earned a "C" or better may be accepted toward the master's degree and will be reviewed by the registrar on a case-by-case basis. The Office of Instructional Technology offers distance learners access to various audiovisual multimedia, video conferencing and serves as the support center for online learning. Distance learners typically finish their master's degree in 1-2 years depending on their course load and scheduling options. Due to regulations, FAMU is not allowed to offer online courses to students from all states. Applicants may not be admitted if they live in a restricted state. Palm Beach Atlantic University is a Christian school established in 1968. Online students at PBA can earn a bachelor's degrees in Ministry, Christian Studies, Nursing, Psychology or Organizational Leadership. Students focus on biblical, historical, theoretical and practical components of their degree area while completing the required 120-121 credit hours for their degrees. Students at PBA experience smaller class sizes with more individualized attention and personalized instruction. In most cases, courses are offered in an accelerated format, with hybrid options on weeknight evenings in Orlando or West Palm Beach, in 8-week terms. Using the school's eCollege and Class Live Pro software packages, hybrid and distance learners participate in online instruction that includes both real-time video and self-paced reading and studying. Applicants must submit their official high school transcripts and complete a writing assessment. Incoming students may transfer up to 88 credit hours toward their 4-year bachelor's degree. Competitive applicants have a 2.5 GPA or higher. Online courses and degrees at PBA are available to students residing in all states except California. Online students at Florida Gulf Coast University can choose from 3 degree completion programs. FGCU offers accredited distance learning options, which helps degree seekers finish all of the upper-division courses needed for Bachelor of Science degrees in Criminal Justice, Health Sciences and Legal Studies. Upper-division courses usually consist of approximately 60 major-specific course credits beyond the general education core, including electives, that are 3000-level and higher. FGCU also offers individual courses that may be transferable toward one of its online bachelor's degrees or another accredited college or university. Online students use the Canvas system to access their course materials, use two-way interactive conferencing technology and collaborate with students. Courses at FGCU can be either synchronous or asynchronous, depending on the course or instructor. In any case, most full-time students without transfer credit take 4 years to complete their degree. To be competitive applicants, prospective students should have a 3.0 GPA, and 1070 on the SAT or 21 on the ACT. Incoming students may transfer up to 60 credit hours toward their 120-credit bachelor's degree, provided they earned a "C" or better in each course. Established in 1883, Florida Southern College is a private institution serving approximately 2,500 students. Online learners can pursue degrees in fields like accounting, business administration and elementary education entirely online or in a hybrid format. FSC also offers an RN-to-BSN program for students with active nursing licensure in Florida. Students can take advantage of the school's accelerated 7-week terms. With this schedule, full-time students can complete 48 credit hours each academic year. As a distance learner, you will be able to work with academic advisers to design a schedule that fits your academic needs and desired timeline. Online students also take advantage of FSC's careers services resources including alumni networking, workshops, job searchers and interview preparation. Incoming students may transfer up to 62 credits from a community college or 93 from a 4-year college or university. ACT and SAT scores are not required for online students with more than 25 transferable credits. While admissions requirements vary per program, prospective students should have at least a 2.50 GPA. Students at Adventist University of Health Sciences can complete three bachelor's degrees in the health care field entirely online. Four-year Bachelor of Science degrees in Nursing (RN-BSN), Radiologic Sciences or Diagnostic Medical Sonography prepare graduates for advancement in their selected fields. Applicants for the RN-BSN program should have an associate degree from a regionally accredited institution, a minimum cumulative GPA of 2.50 and a current RN license. Prospective Radiologic Sciences students who have earned a certificate but don't have an associate degree may be accepted into the bachelor's degree program with a conditional "bridge" status. Those interested in the Diagnostic Medical Sonography program must be licensed sonographers. Online students have access to the R.A. Williams library, individual and group online tutoring sessions and e-therapy counseling for academic, career or mental health concerns. Using the Canvas learning platform, ADU students can collaborate with their fellow students and interact with professors. Additionally, as a Christian school, ADU offers chaplain services to address students' spiritual health. At Southeastern University, a private Christian school, online students can earn a disparate variety of degrees. Southeastern offers bachelor's degrees in Business Administration, Organizational Leadership, Criminal Justice, Ministerial Leadership, Human Services and Psychology. For those prospective students looking for careers in digital marketing, online advertising, graphic design, public relations and event planning, you can earn a Bachelor of Science in Digital Media and Design or Bachelor of Science in Communication and Mass Media. Distance learners in these two majors learn effective communication skills, innovative marketing techniques, techniques of persuasion and hone their critical thinking and problem-solving skills. Depending on the program, ACT or SAT scores may be required for admission. Regardless of major, all prospective students must include their high school transcripts, a personal reference and transcripts from any previously attended colleges. As a Christian school, all students can expect to spend at least 9 out of the required 120 credits in core religion courses. Online students have access to academic advising, the Center for Student Success and the Office of Learning Support Services. Barry University is a private Catholic institution, founded in 1940, with approximately 9,000 students. The school offers more than 50 different undergraduate degrees including several online bachelor's programs. Barry's synchronous online programs include service-oriented degrees like Emergency Management, Health Services Administration and Public Administration. These programs prepare students for careers in the health care industry, public sector work with police and fire departments, government agencies and insurance companies. Online courses with the "PACE" designation follow the same start and end dates and use the same textbooks as its traditional, on-campus counterpart. At Barry, online students have real-time class meetings with professors and their fellow classmates. Bachelor's programs require a minimum of 120 credits for graduation. First-time college students must complete an online application and submit high school transcripts or GED documentation and SAT or ACT scores. Incoming students may transfer up to 90 credits toward their bachelor's degree. The last 30 credits and the majority of the major coursework must be taken at Barry. As an online student, you have access to campus ministry services and spiritual guidance, technical support during regular business hours and the career development center. Distance learners at Keiser University can take advantage of 19 online bachelor's degrees. Students may choose from more traditional degree programs in Accounting, Business Administration, Criminal Justice, Public Safety Administration and Psychology. Students can also find programs that teach them about cutting-edge technologies and prepare them for a number of careers in rapidly growing, modern fields. Similar to other degree offerings at Keiser, the Bachelor of Science in Cyber Forensics/Information Security and Bachelor of Science in Information Technology Management are designed as completion programs for students with an associate degree in a science- or computer-related field. In most cases, Keiser expects students to transfer a minimum of 24 semester credit hours of general education courses from their previous associate program. Keiser's online classes are delivered in an accelerated format, with classes each lasting 4 weeks. Incoming bachelor's degree seekers must submit official transcripts from high school and any previously attended colleges. There is no minimum GPA or standardized tests required for admission. Students at Keiser have access to a number of student services including career advisement, resume writing and job interview preparation, professional development workshops and guided online job search engines. Stetson University offers hybrid learners the chance to earn their master's degree in Accounting, Advocacy and Elder Law in a hybrid online format. The online LL.M. degree in Advocacy prepares students for full-spectrum work in the legal field by combining advocacy skills with proper legal analysis and thoughtful planning. Similar to the master's degree in Elder Law, this is a part-time online engagement wherein student need only to participate in-person 1-2 times a semester. These master's degree can be completed in less than 2 years and are especially suited for prospective students interested in criminal law, civil law and teaching at the college or university level. Tuition per credit is approximately $900-1,400, depending on a student's course load. Stetson offers various services and benefits for military veterans including tutorial services, scholarships and educational and vocational counseling. Online graduate students may be eligible for financial aid. Contact your prospective department chair and the office of admissions to discuss any funding opportunities to help finance your program. Sponsored by the Florida Baptist Convention, the Baptist College of Florida was founded in 1943. BCF offers up to 23 online degrees, including Biblical Studies, Christian Studies, Psychology, English, Ministry, Education and Business Leadership. With courses in finance, ethics and leadership, the bachelor's degree in Business Leadership at BCF prepares students with the values and skills necessary for careers in churches or the public marketplace. The online school also offers degrees in Music Education and Music and Worship Leadership, both of which are rarely found in online learning programs. Students may complete their degrees entirely online or at designated learning sites off campus in Orlando and Jacksonville. In most cases, students need around 120 credits for graduation. Also, as a Christian college, courses are taught from a Biblical worldview. Every degree seeker must take a minimum of 12 semester hours of biblical/theological foundational courses to be eligible for graduation. Online students at BCF pay the same tuition and fees as in-state students. Hobe Sound Bible College is a Christian institution established in 1960. Online students at HSBC can earn their bachelor's degree in General Christian Studies, Ministerial Studies, Elementary Education, Secondary Education, Counseling and Intercultural Studies. The General Christian Studies degree allows for the greatest flexibility of the online programs. Online Learners in this program choose from minor concentrations in Pastoral Ministries, Christian Counseling, Intercultural Studies, Christian Education, Biblical Literature and Theological Studies. Online courses at HSBC are 7 weeks in duration, with 2 online sessions each semester, including the summer. Bachelor's degrees at HSBC require approximately 120 credit hours for graduation. Full-time students typically complete these requirements in 4 years. Online learners are expected to maintain a 2.0 GPA or higher. Those students with a lower GPA than 2.0 will not be able to receive financial aid. All students regardless of geographic location pay the same tuition rates for online courses.There is no minimum GPA or standardized test requirements required for admission. At Everglades University, degree seekers can earn one of 11 online bachelors degrees. From Construction Management and Aviation Studies to Business Administration and Environmental Policy, Everglades distance learners can find training for a career path that suits their needs. A unique program at this school is the Bachelor of Science degree with a major in Alternative Medicine. Students in this program will take courses like general chemistry, health psychology, herbology and botany and general physics to prepare for entry-level careers in the alternative medicine at chiropractic, acupuncture and physical therapy practices, rehabilitation and wellness centers, hospitals and spas. All bachelor's degree seekers complete 30 credit hours of similar general education requirements in addition to major core courses and a series of electives. These undergraduate degree offerings generally require around 120-123 credit hours for graduation and take 4 years to complete. All online applications must include standardized test scores for the SAT or ACT exam. The Office of Admissions expects prospective students to have at least a composite score of 17 on the ACT or 1200 on the SAT. Everglades' student services include academic advising, orientation programs to help facilitate transitions to college life and online library access. The University of Miami offers a flexible undergraduate degree online for those who need to work around work, family or personal committments. The Bachelor of General Studies is an interdisciplinary, online or hybrid program that allows students to develop a tailored program that fit their academic needs and career aspirations. Distance learners have a significant number of electives to choose from and, with careful guidance from academic advisers, many students choose concentrations in management, accounting, finance, marketing, economics, business technology or entrepreneurship. Students in this program must maintain a minimum GPA of 3.0 to remain in good standing. In total, online students need 120 credits to complete this bachelor's degree. Incoming freshman and transfer students should have a cumulative GPA of 2.20 or higher in all previously completed college or high school work. For students transferring from a 2-year community college, at least 56 credit hours must be completed through UM. Students coming from a 4-year college or university must take a minimum of 45 credits at UM. Online tuition per credit is $825 and, in most cases, full-time students complete the program in 2-3 years. Formally Florida Christian College, Johnson University Florida is a private institution established in 1976. As a Christian college, Johnson's online instructors integrate a biblical perspective throughout the curricula. Students looking to earn an online bachelor's degree can major in areas like applied linguistics, business administration, ministry leadership, intercultural studies and pastoral care and counseling. You can also obtain an online minor concentration in business administration or intercultural studies regardless of your major. Online students in the business administration program may choose from concentrations in marketing, management or sports management. These degree seekers develop skills that are useful in a variety of career paths. You will work on your strategic planning skills, organizational development and learn essential human resources management techniques. Students in this program also receive training in economics and financial management, marketing and public relations and ethical and legal issues. Applicants should submit a 500-1,000 word essay describing their Christian commitment, life goals and reasons for wanting to attend Johnson. Prospective students must also send in their high school transcripts, ACT or SAT scores and 2 letters of reference. Online students have access to library resources, live streaming chapel services and 24/7 technical support. How can I find which online colleges offer the degree I'm looking for in Florida? FloridaShines' Virtual Campus, provided by the Florida State University System and the Florida College System, let you search by degree type, degree level and location. You can even search their full directory via keyword or phrase, a feature to help you find a specific program or programs quickly. Which online schools in Florida will accept my transfer credits or work/life experience? Florida's 2+2 system allows students who have completed an associate degree at a Florida college to easily transfer their credits toward a bachelor's degree to any other college in Florida. Students can check their eligibility for four-year programs at this page on FloridaShines. In general, many Florida colleges accept transfer credits from any college or university that is regionally accredited, but it's still important to double check with each college before assuming transfer is guaranteed. Students without official college credits who have comparable work or life experience may translate said experience into credits. Complete Florida offers a number of great tools—including prior learning assessments, alternative credit projects and competency-based education—to help your work/life experience and certificates/credentials work toward a degree. How Much More Do College Grads in Florida Make? In Florida, a bachelor’s degree makes a difference. Compared to those with just a high school diploma, jobs requiring a minimum of a bachelor’s degree pay an estimated $32,000 more per year, and $42,000 more annually than jobs requiring no diploma at all. And professionals working in doctorate-level positions earn nearly $50,000 more per year than those working in bachelor’s-level careers. Florida leads in online learning—according to a 2014 report by the U.S. Department of Education, 16.1 percent of Florida university students were enrolled in an online program in 2012. An estimated 82.2 percent of them were undergraduates. The continued growth of online learning in the state is great for students, but it also puts more pressure on them to find quality programs. In this case, accreditation is everything. Not only does it signal academic excellence, but it can be a requirement to qualify for federal financial aid and to secure a job after graduation. But which accreditation levels are most important? Regional accreditation is the premier stamp of approval for U.S. colleges and universities. Higher education institutions in the state of Florida fall under purview of the Southern Association of Colleges and Schools, Commission on Colleges (SACS). If you’re vetting campus or online colleges in Florida, make sure your shortlist candidates have SACS accreditation. In addition, programs within schools may be accredited by subject-specific bodies such as the Council on Accreditation of Nurse Anesthesia Educational Programs or the Council of the Section of Legal Education and Admissions to the Bar. While not usually a requirement, some employers may look for this specialized accreditation specifically. For example, many employers of psychologists may actively seek candidates who graduated from a program with American Psychological Association (APA) accreditation. Figures are for in-state tuition and required fees only. Room, board and other fees not factored. What are Florida's requirements to qualify for in-state university tuition? To qualify for residency in Florida, first a student must prove they are a U.S. citizen, a permanent resident alien or a legal alien. Second, they need to provide documentation showing they have lived in the state of Florida for the 12 months prior to the academic period for which they plan to enroll. Examples of residency proof include a driver’s license, a voter registration card or a vehicle registration. For more information on the residency process, visit Hillsborough Community College's guide to qualifying for in-state tuition in Florida. Some students may be exempt from the residency process, including active-duty military members stationed in Florida, students that use Florida Pre-Paid and homeless students. For a list of students who fall under residency exemptions, see Sections 2.0 and 4.0 of the state's guidelines regarding residency for tuition purposes. Florida also participates in the Southern Regional Education Board's program known as the Academic Common Market. This network of colleges offer "tuition reciprocity." This means that no matter where you live, if you're enrolled in one of 1,900 qualifying programs, you'll pay in-state tuition. Are online credits more affordable in Florida than other places? Each school and each state will have its own unique tuition standards, though online students may save money by avoiding parking and residential fees. The average standard tuition rate in Florida was $4,438 in 2016, placing the state well below the national average. How can I get help paying for online college in Florida? The first stop for financial aid for any student is to file the Free Application for Federal Student Aid (FAFSA) to see what opportunities might be available. To qualify for federal aid, make sure you’re applying to a college or university that’s regionally accredited. Scholarships are a great source of free money for school, too. Here are a few scholarships and grants specific to Florida. Florida Public Student Assistance Grant (FSAG) Program for Public Schools: The FSAG offers financial aid to undergraduate students who are Florida residents. Eligible students must attend a Florida public state university or community college that is Title IV eligible with U.S. Department of Education-approved accreditation. The institution must also administer Pell Grants. Florida Private Student Assistance Grant Program (FSAG-Private): The FSAG also supports Florida college students enrolled in the private university system. Qualified candidates must attend independent colleges or nonprofit universities. Attend a Florida public state university, community college or career center. Complete specified course work and maintain GPA eligibility requirements. Be enrolled at an eligible public or private Florida university or community college. Not have any current student aid defaults. Hold a minimum 3.0 GPA after 7th high school semester. Academic Gaps Before College From brushing up on reading, writing and math skills to GED Preparation and English for Speakers of Other Languages, Basic Education and High School Diploma Courses are a facet of adult education that prepares aspiring students for college academically. Technical Prep for College Though Florida’s college readiness programs are typically offered for traditional college students coming out of high school programs, there are programs available for adult learners, including seniors, to audit and learn skills taught in college before actually taking a course for credit. Refugee Support An initiative by Palm Beach County, Project Transition helps refugees with basic education and counseling to help guide them to life, career or college success. The U.S. Department of Education’s state profiles for adult education tracked how this type of learning benefited students. Roughly 30 percent of participants in Florida saw a measurable skill increase, validating the need for these programs, especially for people who have experienced hardships and setbacks, such as low literacy, homelessness, incarceration and other situations that may have prevented them from completing their education earlier in life.